Chronic obstructive pulmonary lung disease (COPD) is a lung disease in which the lungs are damaged, making it hard to breathe. In COPD, the airways- the tubes that carry air in and out of your lungs are partly obstructed, making it difficult to get air in and out. 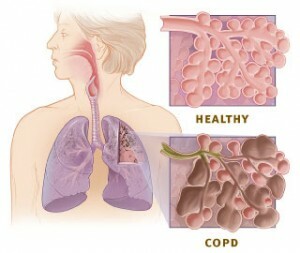 The illustration shows the respiratory system and cross-sections of healthy alveoli and alveoli with COPD. In the emphysema type of COPD, the walls between many of the air sacs are destroyed, leading to a few large air sacs instead of many tiny ones. Consequently, the lung looks like a sponge with many large holes in it, instead of a sponge with very tiny holes. Poor exchange of the oxygen and carbon dioxide causes shortness of breath.